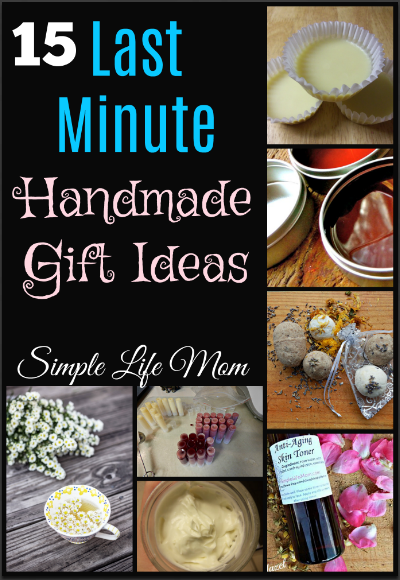 A wonderful list of Last Minute Handmade Gift Ideas is super duper handy to keep on hand. We all have a number of people on our Christmas lists that we’d love to give something special to, but we’re not sure what that special gift might be maybe it would be a gift basket filled with wine or custom bobbleheads. 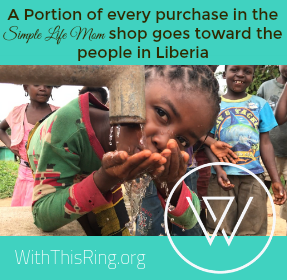 We also have people like teachers, co-workers, postal workers, garbage pickup workers, and friends and relatives that we’d like to give a little something to without breaking the bank. 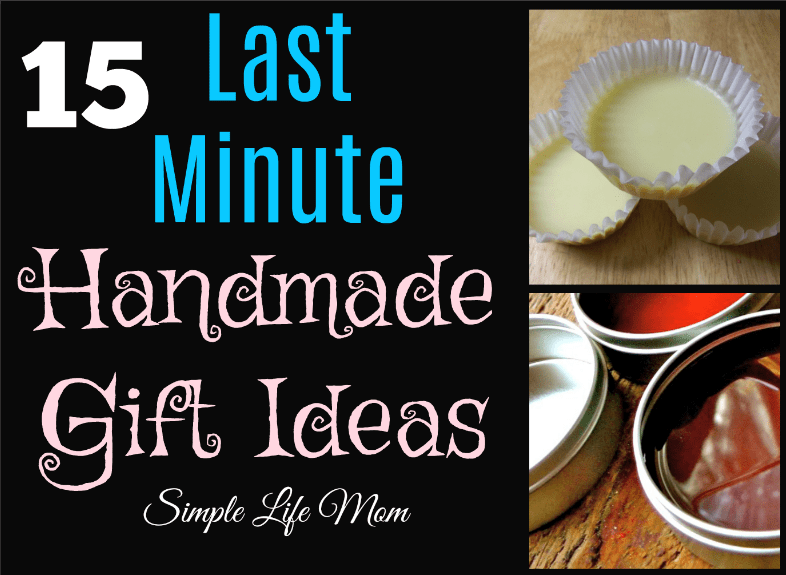 Last Minute Handmade gift ideas (like longer handmade gifts like cold process soap or vanilla extract), are super frugal. You can give special, well thought out gifts to 20 or more people for $20-$30, depending on your project and how elaborate you decide to get. That’s a HUGE savings! Handmade gifts also mean that you put in time and effort to learn how to make something and give something valuable. All of these projects can be made within minutes if you have the ingredients. If you don’t have the ingredients, a lot of them can be found on Amazon with 2-day shipping. Other places like Bulk Apothecary are very quick in their shipping as well. Special Deal: To help you out, this week I’m also doing 10% off in my shop with the code SLM10 so you can give the gift of handmade and support a small business. Check out what’s in my shop HERE. Make enough liquid facial cleanser for your family and to use as gifts. Add a few drops of essential oils of our choice for scent and added benefits. Get the recipe HERE. Toners make your face feel wonderful after washing. They are also easy to make. Make a healthy, non-alcohol toner with essential oils. Find the recipes by clicking HERE. I also make both of these in my shop. 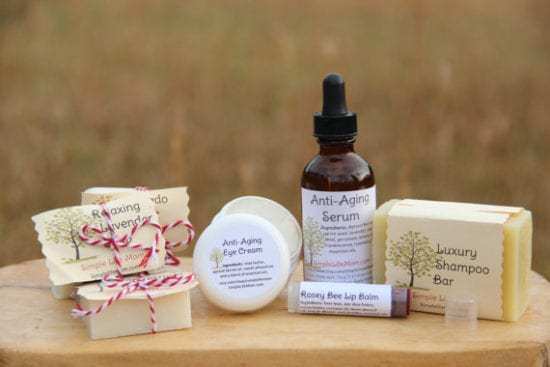 Shea lotion makes a wonderful, luxurious gift and only takes a few minutes to make. Get the recipe and learn how to make the lotion HERE. I also make both of this in my shop. Lotion bars are great for anyone who travels a lot. I liked using them when my kids were little. They seemed to be able to hold them better then trying to use a lotion. Lotion bars can be fun too because you can add your own scent and make them in any shape you’d like. Learn how HERE. I have a number of lip balm recipes here on my blog. I even have an article on how to color the lip balm from orange to pink, to red (click here to learn how). All natural of course! Try a simple lip balm recipe, an herbal recipe, or a chocolate truffle recipe. I also make both of this in my shop. Making a salve is as easy as adding ingredients to a pot, melting the,, and pouring them into individual containers. It can be very fun choosing what extras you’d like to add, including herbs and essential oils. I have a favorite recipe that I use for dry winter hands and feet (I use it on my face too). Get my recipe HERE. I also make both of this in my shop. Bath bombs can be tricky. Sometimes if you don’t have the moisture just right they can fall apart, but a lot of people have a wonderful time creating these beauties for gifts. They’re well appreciated by those of us who love a calming aromatic bath when we can get it. Here’s my how-to instructions for 6 recipes. A lot of people use oils instead of lotions for deep winter moisturizing. These recipes are great for moisturizing, as massage oils, or for joint pain, depending on the oils used and essential oils added. Check out the options HERE and HERE. Use your imagination and have fun. I also make both of this in my shop. If you know someone who diffuses oils, or you’d like to give someone a kit to get started, here are some fun ideas. My kids really enjoyed making felt or clothes pin diffusers for dad. You can make your own with felt, necklaces, terra cotta, and more and use them in your car, office, home, drawers, even in stinky shoes. I have 2 sets of ideas to get you going: 5 Essential Oil Diffuser Methods and 5 Car Air Freshener Ideas. This is a gift idea from kids that brings back memories for a lot of people. Pouring hot wax means a lot of adult supervision, but we’ve done it with kids without ever a problem before and they love and are very proud of their glittery creations. Learn how to make the candles HERE. Elderberry syrup is easy to make and has wonderful benefits for the body. Elderberry actually stops viruses from being able to break in and multiply within cells. By drinking 1-2 Tablespoons before and/or during getting sick you speed recovery greatly. We always keep elderberry syrup on hand. Anyone would be happy to receive it as a gift. Learn how to make it HERE. I put together a great list of 20 herbs that make great tasting herbs and happen to be wonderful at de-stressing the body both mentally and physically. Learn more HERE. You can put together a sample gift set of herbal teas for the tea lover that you know. This salve is great for muscle and joint pain by reducing inflammation and slowing pain signals to the brain. Learn how to make it using this recipe. Anyone who cooks, gardens, or knows the value of herbs would love the gift of an herb garden. You can buy planter sets like these and then choose your own herbs to plant in them. Popular cooking herbs are basil, oregano, and rosemary. They’re also easy to grow and stress free. Learn more about growing herbs HERE. Make your own kettle corn and package in bags like these and tie with a pretty ribbon. It makes a great gift when you have a lot of people to give something to. Another great thing about this gift is, it is pretty unisex. A lot of people have loved this! I have also seen people loving watches at the minute, they seem to have come back into fashion quickly. Places like mens watches online are perfect for buying watches as a gift! The classic! Hot chocolate mix in a mason jar with only healthy ingredients. Ok, there’s sugar, but no preservatives or other weird things. Make your own marshmallows to add in the jar as well. Get the hot chocolate mix recipes HERE. There’s my list of last minute Handmade gift ideas! I hope you’ve found some inspiration. Let me know if you have any questions or other ideas to add in the comments for others. You are so very gracious to share your anti-aging recipes with us. First I bought your anti-aging gift set about a month ago to see if I would like it. I love it! Better yet, my skin loves it! I was afraid the serum would make me break out, because my skin has always been oily. But it hasn’t. My skin is more supple and health and happy-looking. I’m running out of your ant-aging eye cream first, and I made your recipe up this past Friday. I had all the essential oils already because I’ve been a member of the Spark Naturals Oil of the Month Club for a long time. I am thrilled with the way it turned out – it set up nicely. So thank you very much, Kelly, you’re the greatest!! That’s wonderful Carolyn. 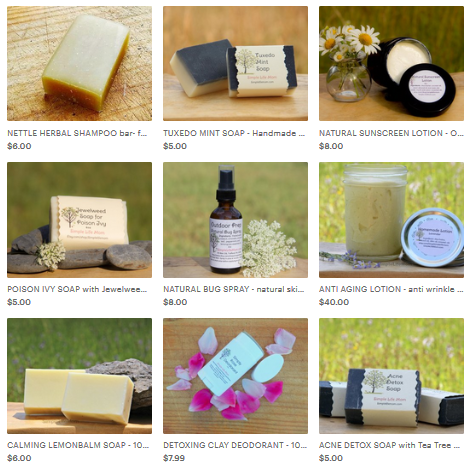 It brings me joy to encourage other to make their own products. You got this! ? I’m glad you like them so much. Hi, I saw a paragraph for lip balm but couldn’t seem to find the recipe. I have made my own lip balm for a couple years but the last batch turned out grainy, as if I had added sand. It still melted on my lips but was unpleasant to use. Maybe without my recipe it will be hard to answer my question…but any idea why this would happen. I would appreciate any help, and especially the recipe you use for lip balm. BTW, I already receive your newsletter. Thank you. You can click on the links in that section and find a number of lip balm recipes. Sometimes the ingredients will separate (even if the lip balm is fresh) when exposed to heat and humidity. Keep in a cool place to help avoid the separation.